The phenomenal worldwide success in the 1980s of the musical Cats refuelled interest in T.S. 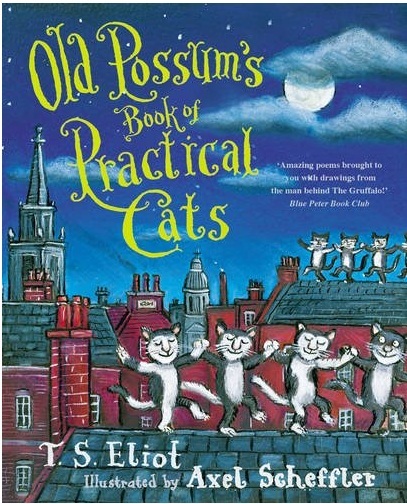 Eliot’s classic Old Possum’s Book of Practical Cats on which the stage extravaganza was based. Old Possum’s Book, originally published in 1939 and dedicated to Eliot’s godchildren, contains a delightful rogues’ gallery of felines, including the Rum Tum Tugger cat whose “disobliging ways are a matter of habit”, Mr Mistoffelees “The Original Conjuring Cat” and Macavity: The Mystery Cat “the master criminal who can defy the law”. Loved by generations of children and adults alike, Old Possum is perhaps most remarkable for having been written almost as an aside, a plaything, by Eliot. I have to admit that it was an embarrassingly short time ago when I realised that the poems written by T.S Eliot provided the lyrics for the musical Cats. Don’t get me wrong, I knew that the musical was based on these poems (I’m not completely culturally challenged, I’ll have you know), but I had no idea that the poems were the exact words to the songs. It was when I was in the first year at university and I had taken a module called “The Literature of Laughter” (fyi… that was a misleading title. I think I laughed once. And that was out of nervousness because the lecturer frightened me). We had read all the set texts and we were nearing our exam and the lecturer had no idea what to do with us. So she brought in a boxful of the BBC’s The Nation’s Favourite Comic Poems edited by Griff Rhys Jones (A wonderful collection and I’d definitely recommend it, by the way) and we were told to find our favourite. Now I love Cats, I’ve seen it about three times on the stage and I’d go and see it a million times more. My Cats claim-to-fame (because, like, everyone has one, right?) was that I once saw Mister Mistoffelees having a pint in the theatre bar after the show! So back in the seminar room, I turned to my equally Cats-loving friend and we had a bit of a giddy five minutes. Here is where I would love to tell you that my friend and I broke out into a full-on dance routine to Macavity but alas I can’t. We did however go home and watch the DVD and recruit my other house mate to join us in our leaping. And, guys, it was spectacular. Although we did have to judge our high kicks so we didn’t knock over the precariously balanced tower of electrical goods that we kept in an alcove. Um…. I have no idea what I was originally talking about and I just remembered I’m supposed to be writing a review here. Summing up: I didn’t know that the lyrics were taken word-for-word from T.S Eliot’s poems. I love musicals. I can do a mean high-kick. Then I bought a copy of Old Possum’s Book of Practical Cats and it fast became one of my favourite collections. What I love most about these poems is how much effort Mr Eliot put in thinking about the placing of the words. A lot of people say that it’s easy to write poetry, but I think what they actually mean is that it’s easy to write bad poetry. Eliot knew how to write brilliant poetry and he truly was a master of words. I would eat my reviewer’s bonnet if you could find someone else who could use words such as “perpendicular”, “physiognomy”, “terpsichorean”, “prestidigitation” and “legerdemain” in a poem and make them as brilliant as these. They are the perfect poems to read out loud and/or to warble tunelessly. and Skimbleshanks: The Railway Cat. I would book Mr Mistoffelees for every party I went to and I would never be late to them because Skimbleshanks would not allow it. You get two because I feel like treating you…. also because I wanted an excuse to listen to them again. Like I need one. Skimbleshanks: The Cat of the Railway Train. I know that I joke around with writing poetry but if I were to ever publish a collection, I would be happy if it was half as original, creative and full of joy as this one. This review is part of my A Week in Verse feature. 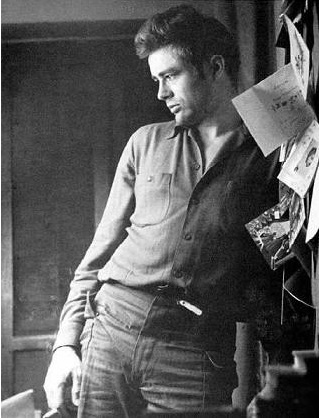 To find out more about this feature and why James Dean is getting involved clickety click. I only discovered Cats was based on this collection when I went to see the show for the first time last year! I loved the songs in the show so I'm keen to check out the actual poems. In the show my favourite was Rum Tum Tugger. I actually didnt know that the songs from cats were these poems until your review… opps! Even worse is the fact that I think I own this book! haha shows I never read it! my sister bought me a boxset of different poets when I was a teen and I kinda never took them out the box! I think I might have to now though! Pingback: 11 Literary Giants That Have Penned Delightful Children’s Books | シ最愛遲到.! « A Week in Verse: An Introduction.